This entry was posted on Tuesday, December 4th, 2018 at 10:53 am. NOVEMBER has been a busy month for Bratton Silver Band while a number of performances have also been lined up over the Christmas period. 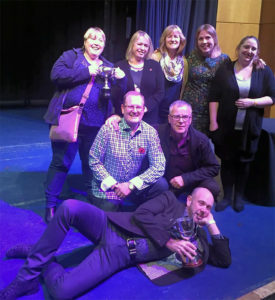 Lucy Scott reports, “We were delighted to come first in our section at the South West Brass Band Championships held in Torquay and to be presented with the prize for the best horn section too. A highlight for the month was ‘Greater Love Hath No Man’ when we joined together at St James Church in Trowbridge with The Choir of the Western Wynde and the Royal British Legion for an evening commemorating the 100th Anniversary of the end of The Great War 1918-2018. “As always, we were pleased to join with villagers in St James Church and at the village war memorial on Remembrance Sunday. In 1914, members of the band joined the forces, and during the war years the band was unable to continue. It was a fitting tribute to those who lost their lives, for band member Geoff Whitehead to lay a wreath on behalf of us all. The band will also perform at Centre Parcs Winter Wonderland on Tuesday 11th December and Tuesday 18th December, Edington Christmas Lights Switch-on on Friday 14th December, Asda in Frome on Saturday 15th December and then Southgate Shopping centre in Bath on the same day, the Bratton Baptist Church Carol Service on Sunday 16th December from 6.30pm, then performing Christmas music at The Duke on Thursday 21st December from 8pm, Festival of Carols at Imber Church on Saturday 22nd and also part of St James’ Church Carol Service on Sunday 23rd December from 6pm.